CAREERS. 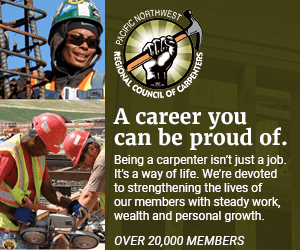 Trades and Apprenticeship informational session offered by Oregon Tradeswoman., Inc. 9 a.m.-3:30 p.m., PCC Workforce Training Center, 5600 N.E. 42nd Ave. (at Killingsworth Street). T.V. TURN OFF. The last day of T.V. turn off week. Where parents are encouraged to have their children explore other options instead of watching television. ROSE PARADE. The 82nd Avenue Rose Parade will stretch from 82nd Avenue to S.E. Yamhill, ending at S.E. 78th. 9 a.m. Eastport Plaza, 4000 S.E. 82nd Ave.
CONFERENCE on women's health with columnist Jane Brody. 7:30 a.m.-4:30 p.m., Oregon Convention Center, 777 N.E. Martin Luther King Jr. Blvd. FAMILY FUN. Enjoy Portland Saturday Market with food, music and art. 11 a.m.-4:30 p.m. Under Burnside Bridge, S.W. Front St. and First Ave.
STORY STOP. Children ages 0-6, and adults, will have story time. 2-2:15 p.m. Central Library, 801 S.W. 10th Ave.
NEW CRAFT. A knitting and crocheting class for beginners. Ages 8-adult. 4-5 p.m. Belmont Library, 1038 S.E. 39th Ave.
TECHNOLOGY Lab assistants are available to help beginners practice their computer skills. 12:30-4:30 p.m. North Portland Library, 512 N. Killingsworth St.
On sexual discrimination in employment. 9-11 a.m. YWCA Clark County, Community Room, 3609 Main Street, Vancouver. POUNDS OFF. For support and fellowship for those shedding weight. 8:45-10 a.m. Madeline School, Antioch Room, 3123 N.E. 24th Ave.
VIDEO AND PHOTOWEAVING. The art of Dinh Q. Le will be on display. 6-9 p.m. Elizabeth Leach Gallery, 417 N.W. 9th Ave. YOUTH SHOWCASE. Support the children as they display their talents. 6 p.m. Highland Christian Community Center, 7600 N.E. Glisan St. Ceramic Showcase. More than 300 artists and adult and children clay areas. 10 a.m.-9 p.m. Oregon Convention Center, 777 N.E. Martin Luther King Jr. Blvd. BOOKS FOR ALL. Celebrate free comic book day, with comic book giveaways all day. 10 a.m.-7 p.m. Bridge City Comics, 3725 N. Mississippi Ave. INSPIRED MUSIC. Children of all ages will showcase their talents from piano to singing. 4 p.m. The Old Church, 1422 S.W. 11th Ave.
ARTS FOR CHILDREN. Create three-dimensional animals with colorful paper. Ages 4 and up. 1-3 p.m. Gregory Heights Library, 7921 N.E. Sandy Blvd.